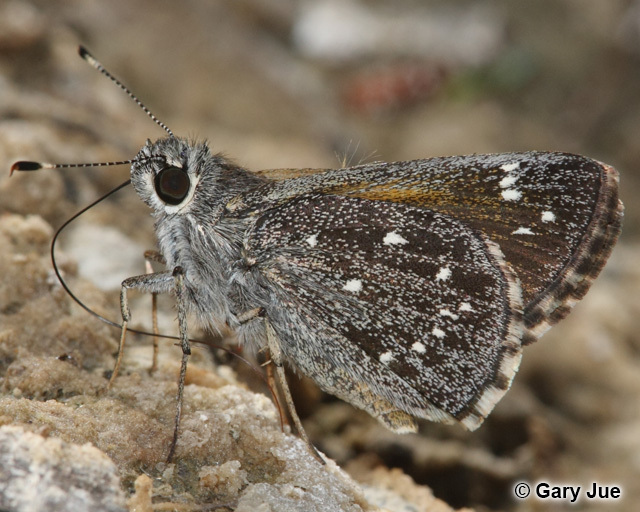 Identification: Fringes are checkered; male forewing has a long stigma. Upperside is brown with an orange tint; forewing has small white spots. Underside is dark brown with gray overscales; forewing repeats upperside pattern but with larger spots, hindwing has many small, white spots. Life History: Adults are most active in the morning, and spend the rest of the day in shady places. Caterpillar Hosts: Probably muhly (Muhlenbergia emersleyi) in the grass family (Poaceae). Habitat: Open woodland, oak canyons. Range: Arizona and southwestern New Mexico south into Mexico.